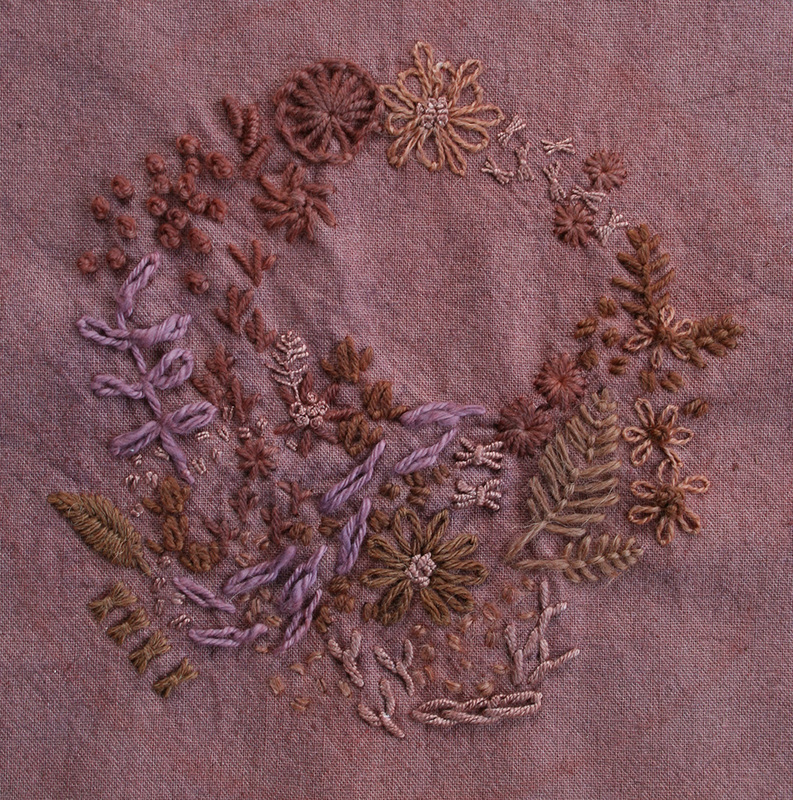 A detail shot of one embroidery dyed in Dyers Chamomile with an Alum Mordant. For the past few years my fellow instructor at Needlework, Thea Haines, has taught some natural dye and embroidery workshops. Every year this specific workshop has run either while I was away or while I was working (gah!). But this year the stars aligned and I snagged a spot in this perfect-for-me class, since I have never had any training in embroidery OR natural dyes! Prepare for a picture overload, because this is maybe one of the most photogenic projects I have ever done and I really went to town documenting it. The first evening we learned a bunch of embroidery stitches and Thea supplied us with all of the fabrics and yarns (plus extra to take home). I had really anticipated the Natural Dye section and wasn't too sure what I would feel about the embroidery part but it turns out I LOVE embroidery! We went home with tons of materials and instructions to embroider at least 2 more samples for the three different dyes we were trying. I really poured a ton of (super enjoyable) time into these and I really love how they came out. The second night we learned all about natural dyes and how to measure and weigh our materials and take safety precautions and how long and how much heat and all that. The three dyes we chose as a group were Logwood (which makes a deep purple), Madder (which makes a coral red colour), and Dyers Chamomile (which makes a golden yellow). I really felt like watching Thea's whole process was invaluable. My stitch sampler from our in-class lesson on embroidery stitches. A variety of yarns and threads stitched onto a grey linen and cotton blend. Here is the first sampler after a long time in the Madder dye pot and a short time in the Logwood dye pot, with an Alum mordant. It's fascinating how some of the yarns (merino wool and silk) picked up more red madder colouring and some (like the cotton) really absorbed the logwood purple. Sampler 2 - a variety of all white yarns stitched onto a fine white 100% linen. Sampler 2 went just into the Madder dye for the entire time. It really picked up a lovely bunch of pink and coral shades. Pretty! Sampler 3 - A variety of yarns (some pre-dyed by Thea) stitched onto a thick yellowy-beige hemp canvas which was pre-mordanted with Alum. This was my least favourite material to embroider on, it really hurt my fingers yanking the thick yarns through the tight canvas. Here is a shot of this Sampler 3 going into the logwood dye. You can see how dark the purple is in this pot! Here is Sampler 3 after a logwood dye bath with an Alum mordant. I was really hoping the dye would overpower all the pre-dyed threads I had used and I am really happy with the result of that. It definitely feels more coherent now. A detail shot from an angle so you can see all the texture! The texture of embroidering with yarns has definitely won over my heart. My final embroidery piece and the one that took the most time (and every single piece of remaining yarn - which was a LOT of yarn!) is this negative space version of my daughters name. This embroidery of Molly's name feels so special. I just drew big block letters on the fabric with a pencil and then started working big space-filling flowers all over, making sure I used the same yarns in multiple places all across the work, even though that meant moving the hoop a bunch of times. Then I started filling in around the flowers with some leaves and other stitches until I used up all the yarn and was forced to stop. Thea had given us a 4-ply silk yarn that I separated into individual plies to make it go further since it was one of the last yarns I added and I knew I was getting down to no materials! The silk feels really special and lovely and I feel like it's the sheen from it that makes this piece feel astonishingly classy. This piece took a full day (fitting it in while Molly napped or when she was eating). Here is our giant "tea bag" of Dyers Chamomile that Thea grew in her own garden, just added to the pot of water. So pretty, dyeing with flowers! Molly's name after being in the Chamomile dye for a long time and then in the madder dye for maybe three minutes to give it a orangey-er tone. This one is definitely my favourite! We are going to frame it in her room. I love love love how that one yarn (I think it might have been Merino Wool?) really absorbed the yellow and orange colours the most. All of the undyed embroideries together. All of the finished embroideries after dyeing, drying and being pressed! Altogether, this is one of the best classes I have ever taken in terms of sheer amount learned in only two lessons. I feel so inspired! More embroideries! More dyeing! More!!! I also want to really thank Thea for being so open and free with her information. I had a thousand questions and she happily answered all of them - she was also really encouraging and excited to see our work progress. Oct 29 We're Having Another Baby!